“Inspector Chen”, hero of Qiu Xiaolong’s novel, has a weak stomach. He does not like the odd delicacies offered at receptions and traditional Chinese restaurants, such as live boiled turtle soup and live braised monkey’s brain. However, to trap his suspect into a confession, he sets up a horrible banquet with “cruel food”, dishes to make even the greatest gourmand squirm. He toys with the suspect, stage-managing the scene, and finally revealing the strange and shocking truth. Chen is a mesmerising sleuth. He is insecure, self-indulgent and prone to symptoms of anxiety. He likes poetry and literary analysis and his police department colleagues cannot quite understand him. But he is also kind-hearted, highly observant, intuitive, persistent and clever. No reader of a mystery can ask for more, other than a gripping plot and dramatic denouement, which the novel does possess. Red Mandarin Dress is the fifth Inspector Chen novel, all of which are set in present day Shanghai. A pretty girl is found dead, wearing nothing but a red cheongsam, a classical mandarin dress. These used to be worn by high society women and were made of silk, with small buttons, a high collar and a slit high up the thigh. While the police are tracing the identity of victim no. 1, another girl is found dead in the same type of dress, and then another. Fearing a serial killer is roaming the city, Inspector Chen is specially commissioned to trace the murderer. The clue to the mystery is the cheongsam dresses worn by the victims. This is one element which makes the novel identifiably Chinese. Another is the pervasive party politics – Inspector Chen and his Department cannot make a move without the involvement of high-ranking party officials and informants. The plot is as much a political game as it is a game of hide-and-seek. Chen does not veer away from calamitous political events in China’s history, such as the Cultural Revolution. Today, the Cultural Revolution is seen by most people inside and outside China, including the Communist Party of China and Chinese democracy movement supporters, as an unmitigated disaster, and as an event to be avoided in the future. Authors may avoid writing about shameful episodes in the histories of nations – especially when penning a jolly good thriller – since it could be seen as unfashionable, unpalatable and possibly even politically incorrect. Another recurring theme is that of traditional cuisine, interwoven with the theme of classical Chinese literature and philosophy, subjects that were outlawed during the Cultural Revolution. Chen, a former student of English literature, embarks on an MA programme in Classical Chinese literature as an excuse to escape being assigned an awkward case. His first study is on the theme of “thirsty illness” in Tang Dynasty poetry. Researching his paper, Chen – and the reader – come to understand the link between romantic love, obsession and the killer’s thirst for revenge. 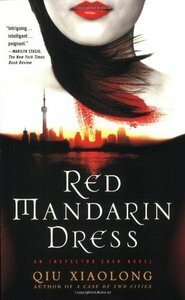 Red Mandarin Dress is not completely unputdownable but it is a gripping, quick read. The images which Qiu Xiaolong creates stay with you long after you have put down the book – especially the cruel food. The language is fluent, elegant, unmarred by translation, and does not impede the reader from understanding the foreign and unusual settings and characters. Qiu Xiaolong (Chinese: 裘小龙, /ˈtʃuː ˌʃaʊˈlɒŋ/; born Shanghai, China, 1953) is an English language poet, literary translator, crime novelist, critic, and academic, currently living in St. Louis, Missouri, with his wife Qiu Xiaolong (Photo from: http://www.qiuxiaolong.com) He originally visited the United States in 1988 to write a book about T. S. Eliot, but following the Tiananmen Square protests of 1989 a newspaper reported on his previous fundraising efforts for Chinese students, and he was forced to remain in America to avoid persecution by the Communist Party of China. He has published six crime-thriller/mystery novels set in Shanghai in the 1990s at the point when the People’s Republic of China is making momentous changes. These include Death of a Red Heroine, which won the Anthony Award for best first novel in 2001, and A Loyal Character Dancer. All books feature Chief Inspector Chen Cao, a poetry-quoting cop with integrity. But the main concern in the books is modern China itself. Each book features quotes from ancient and modern poets, Confucius, insights into Chinese cuisine, architecture, history, politics, herbology and philosophy as well as criminal procedure.